Mankind history has not been described among the whole history through a universe such as nature, the earth, the solar system, the Galaxy and so on subsumed human beings as part of them, but by the only limited history of human society. It is impossible to describe the true mankind's history without looking down at the human history from the whole history of universe however so many countries had been born and disappeared repeatedly in the human history. There is no guarantee the nation of Japan is going to survive in the future. The past history proved so many countries disappeared. First of all the eastern countries, the Soviet Union had been disappeared which was one of leaders in the Cold War and next ones, Yugoslavia, Czechoslovakia, East Germany and so on also disappeared after the greatest and longest catastrophic Cold War in the 20th century. The people of nation never disappear even though the nation disappears. The people of Soviet Union became the people of Russia, the people of Yugoslavia became the people of Serbia, Bosnia and Macedonia, the people of Czechoslovakia became the people of Czech Republic and Slovakia Republic, and the people of East Germany became the people of unification of Germany. The nations are all indeed illusionary ones. Then what is a trigger for the nation to be born and disappear? The ancient nation Troy disappeared by lost at the Trojan War against Greek first and two times of the great world war and the Cold War in the 20th century proved that war is the most elemental key for the nation to be born and disappear. The king Agamemnon of Greece who was so greedy and cruel became the winner because the bravest and fairest Achilles was for him. On the other hand, the king Priam of Troy who believed in his priest on behalf of God Apollo too much became the loser because he was not for his wise and brave son Hector. The German nation who had suffered from the First World War expected Adolf Hitler too much as a savior and they lost their country. Achilles and Hitler had been newly-born human who could not be understood by ordinary people in those days. The nations are born and disappear when the newly-born human comes to appear. The nations were born and disappeared during not only between the First World War and Second World War but at the end of the Cold War. The nations will surely be born and disappear by the appearance of newly-born human in 21st century, and then the survival nations shall be asked for what they should do. They will surely change into a newly-born nation even if they will be able to succeed to survive. The nation of Japan must also change into a newly-born nation so that they prevent from disappearance of nation. I shall make a proposition for Japan to survive in 21st century in the book of “New way to Japan according to the mechanism of the universe”. Apes are called our mankind’s ancestor. Apes evolved into mankind’s ancestor Australopithecus 5 million years ago, Australopithecus evolved into the primitive man (Homo erectus) called two-leg Java man and Peking man 500,000 years ago, Homo erectus evolved into the Old man called Neanderthal man more than 100,000 years ago, the Old man evolved into the New man called Cro-magnon more than 10,000 ago and succeeded to the ancient man, the Middle Age man, the modern man and the current modern man after that. Then when, where and how the apes passed a baton to Australopithecus, Australopithecus passed a baton to the primitive man (Homo erectus), the primitive man (Homo erectus) passed a baton to the Old man, the Old man passed a baton to the New man, the New man passed a baton to the ancient man, the Middle Age man, the modern man and the current modern man? It is impossible to imagine that such a baton pass between apes and Australopithecus had been done in some time and some place. It is possible to imagine that the character of mankind had been appeared without being aware as well as the character of apes had been disappeared without being aware and became full mankind without being aware during many generations. Furthermore the evolution from apes to mankind had been made with some part of apes which must be “new apes” different from other apes which exist even now because apes couldn’t exist if all apes had evolved into mankind. It is such an evolution that could have been made between mankind and human beings. Therefore, the evolution between mankind and human beings had been made with some part of them and mankind could still exist even now however it could be impossible to see them because all mankind evolved into human beings? An occurrence between apes and mankind could have been made between mankind and human beings, succeeded to between apes and mammal, between mammal and reptile, between reptile and amphibian, between amphibian and fishes, between fishes and multi-celled organism, between multi-celled organism and single-celled inorganic furthermore to birth of the earth, the sun, the Galaxy and universe at the same time to between Australopithecus and the primitive man (Homo erectus), the Old man, the New man, the ancient man, the Middle Age man, the modern man and the current modern man. It is the fact of evolution that “new species” appear at a certain generation and “old species” and “new species” exist together however “new species” mainly. All kinds of human beings such as ancient men, Middle Age men, modern men, “old species” exist together with our current modern men like society of apes exist together human society. Imperial House of Japan takes pride of 125 emperors and their number of ancestors is astronomical figures because each emperor was born of each mother and father which is multiple to 2125. Each mother and father was born of each two grandmothers and grandfathers, and each two grandmothers and grandfathers were born of each four great grandmothers and great grandfathers and so on. There should be 210=1,024 human ancestors when tracing back for 10 generations. There should be 220=1,048,576 human ancestors when tracing back for 20 generations. There should be 230=1,073,741,824 human ancestors when tracing back for 30 generations. There should be 240=1,099,511,627,776 human ancestors when tracing back for 40 generations. There should be 2100=1,267,650,600,228,238,993,037,566,410,752 human ancestors when tracing back for 100 generations. Imperial House of Japan has 125 emperors however direct descendants are 76 generations. Therefore, there should be 276=75,557,863,725,914,406,838,272 ancestors when Imperial House tracing back for 76 generations. However, the number of mankind on the earth was 1,000,000 two hundreds ninety thousands years ago. In other words, it was the time when the population was exceeding by 220= 1, 047, 576 human beings. The number of mankind on the earth was 5,000,000 ten thousands years ago. In other words, it was the time when the population was exceeding between 222= 4, 194, 304 and 223= 8, 388, 608 human beings. The number of mankind on the earth was 87,000,000 at B.C. 4000. In other words, it was the time when the population was exceeding between 226= 67, 108, 864 and 227= 134, 217, 728 human beings. The number of mankind on the earth was 300,000,000 at B.C. 0. In other words, it was the time when the population was exceeding between 228= 268, 435, 456 and 229= 536, 870, 912 human beings. The number of mankind on the earth was 430,000,000 at A.D 1500. In other words, it was the time when the population was exceeding between 228= 268, 435, 456 and 229= 536, 870, 912 human beings which means even one new species (new human being) had not appeared between B.C. 0 and A.D 1500. The number of mankind on the earth was 6,300,000,000 at A.D 2000 when it was the time of rapid growing of population. In other words, it was the time when the population was exceeding between 232= 4,294, 967, 296 and 233= 8,589, 934, 592 human beings. There is no possibility of succession as human beings for Imperial House to continue 76 direct descendants because the number of mankind on the earth at B.C. 660 when the first emperor “Jinmu” had succeeded to the throne. The number of mankind on the earth was 6,100,000,000 at the end of 20th century and is exceeding 6,500,000,000 at the present (at A.D 2007). There should be 231=2,147,483,648 human ancestors when tracing back for 31 generations. There should be 232=4,294,967,296 human ancestors when tracing back for 32 generations. There should be 233=8,589,934,592 human ancestors when tracing back for 33 generations. Therefore, the human ancestor who is 32nd generation steps 14th generation back to the primitive man (Homo erectus) who was the 18th generation and 15th step back generation was not mankind but apes called Australopithecus. Passed a button to the primitive man (Homo erectus) who was two-leg from Australopithecus who was four-leg had happened 500,000 years ago at 14th generation. The number of mankind on the earth should be 10,000,000,000 in the 21st century. There should be 234=17,179,869,184 human ancestors when tracing back for 34 generations. Therefore, the human ancestor who is 32nd generation steps 15th generation back in the 21st century. In other words, 21st century is a turning point whether the 33rd new generation comes to appear or not. The number of mankind on the earth is exceeding 6,500,000,000 at the present (at A.D 2007). The 32nd generation was born when the population was exceeding by 232 =4, 294, 967, 296 human beings. The 33rd generation was born when the population was exceeding by 231=8, 589, 934, 592 human beings. Therefore, we modern man is 14th generation of mankind. The dawn of mankind was from the primitive man (Homo erectus) who was two-leg 500,000 years ago and before the primitive man (Homo erectus) had been apes called Australopithecus. On the other hand, the Old man who was 20th mankind appeared from the primitive man (Homo erectus) as a mutation. The 20th generation was born when the population was exceeding by 220 =1, 048, 576 human beings. Therefore, the mankind’s history is between the primitive man (Homo erectus) 500,000 years ago and modern man at present that is an evolution from 19th mankind to 32nd mankind. To put it another way, the mankind had evolved 14th generation as mankind’s history and 18th generation as an organic life during 500,000 years ago and 3.6 billions years ago. It means the history of organic life which was born 3.6 billions years ago on the earth which was born 4.6 billions years ago condensed between 20= 1, an single cell life and 232=4,294,967,296, the current human being. A look of evolution from a single cell new life to human baby in the womb of mother for 280 days is indeed a recreation of human’s evolving process from 20 to 232 which is projecting mankind’s ancestor like a phantasmagoria. We could find that it is very important and imperative for the whole history to focus about generation but not length of year when going over our human being’s history as one page of the history of universe, the history of organic life and history of mankind. Rapid increasing the number of mankind is nothing but increasing the changing of generations which is entering into rapid changing and turbulent times. Newly-born mankind begins to appear at the changing of generations. Our historical view has been just for the sake of (conqueror) ruler. Mankind has stepped up 14th generations for 500,000 years. As mentioned before, it is very important for us to have a historical view as member of organic lives on the earth but it is not enough. We must have a historical view as member of universe. Universe has stepped up 18th generations during from the birth of universe 13.7 billions years ago which was the “big bang” to the birth of mankind 500,000 years ago. The whole history of universe from the “big bang” and born of universe happened 13.7 billions years ago, born of the sun 5 billions years ago, born of the earth 4.6 billions years ago and born of organic life 3.6 billions years ago are condensed between 20= 1, single ‘space’ and 232=4,294,967,296, the current human being. The world of thingness was born of the world of nothingness. In other words, 10 = 20. After this, it has been evolving 20・21・22・23・24・・・. The ‘big bang’ is 10 = 20. It was 21 that G-force (Gravitation force) ramified from only one force one of the 44th power of 10th second after the ‘big bang’. It was 22 that strong force ramified from only one force one of the 36th power of 10th second after the ‘big bang’. It was 22 that weak force and electric force ramified from only one force one of the 11th power of 10th second after the ‘big bang’. It was 23 that the light sea ‘space’ was born by pair annihilation, the collision of the positive matter of X particle with the antimatter pair annihilation of matter one of the 100 seconds after the ‘big bang’. (‘Space’ of electron, proton and neutron was born). It was 24 that the bonding of atomic hydrogen and helium began 3 minutes and 46 seconds after the ‘big bang’. (‘Space’ of atom was born). It was 25 that the ‘space’ of hydrogen gas and helium gas was born 34 minutes and 40 seconds after the ‘big bang’. (‘Space’ of molecule was born). It was 26 that the nebula ‘space’ of the mass of hydrogen gas helium gas which was primitive galaxy was born a million to a billion years after the ‘big bang’. (Nebula ‘space’ of plasma and gas was born). It was 27 that the star was born 5 billion years after the ‘big bang’. (Star ‘space’ of gas was born). It was 27 that the sun was born 8.7 billion years after the ‘big bang’ which was 5 billion years ago. (Fixed star ‘space’ was born). It was 28 that the earth and moon was born 9.1 billion years after the ‘big bang’ which was 4.6 billion years ago. (Planet and satellite ‘space’ consist of gas/liquid/solid was born). It was 29 that the creatures on the earth was born 10.1 billion years after the ‘big bang’ which was 3.6 billion years ago. (A unicellular creature was born). It was 210 that the organic life on the earth was born 12.9 billion years after the ‘big bang’ which was 0.8 billion years ago. (Animal was born). It was 210 that the explosive evolution occurred 13.1 billion years after the ‘big bang’ which was 0.6 billion years ago. (Evolution began). It was 211 that the fishes appeared in the sea 13.2 billion years after the ‘big bang’ which was 0.5 billion years ago. It was 212 that the plants appeared on the land 13.3 billion years after the ‘big bang’ which was 0.4 billion years ago. It was 213 that the amphibians appeared in the sea and on the land 13.4 billion years after the ‘big bang’ which was 0.3 billion years ago. It was 214 that the reptiles appeared 13.5 billion years after the ‘big bang’ which was 0.2 billion years ago. It was 214 that the dinosaurs appeared and exterminated. It was 215 that the primitive mammals appeared 65 million years ago. It was 216 that the primitive mammals exterminated and modern mammals appeared 34 million years ago. It was 217 that the primates (an anthropoid) appeared 24 million years ago. It was 218 that the ancestor of mankind (an ape) appeared 5 million years ago. It was 219 that the primitive man from ape appeared 1.8 million years ago. It was 219 that the primitive man reached their peak 500,000 years ago. It was 220 that the Old Man appeared 300,000 years ago. It was 220 that the primitive man declined and the Old Man reached their peak 130,000 years ago. It was 221 that the ancestor of human being (the New Man) appeared 30,000 years ago. It was 221 that the Old Man declined and the New Man reached their peak 13,000 years ago. It was 222 that the civilization of human beings was born at B.C 10,000 and it now comes 232. The female of human evolved from nothingness to thingness by the ‘big bang’ which is pregnancy and then new life which is finite ‘space‘ 13.7 billions light-years expanse - image ‘space’, motion ‘space’, relative ‘space’, ‘motion space of light and sound’ shall be evolving again within ten months and ten days (280 days) which is a pregnancy period. 10 = 20 is only one force. 20 = 1 is G-force (Gravitation force). 22 = 4 is G-force (Gravitation force), strong force, weak force and electric force. 23 = 8 is the birth of elementary particle (electron, proton and neutron). 24 = 16 is the birth of atom. 25 = 32 is the birth of molecule. 26 = 64 is the birth of primitive galaxy (nebula) ‘space’ which is the birth of ‘space’. 27 = 128 is the birth of (fixed) star (the sun). 28 = 256 is the birth of planet/satellite (the earth and moon). 29 = 512 is the birth of the creatures. 210 = 1024 is the birth of the organic life. 211 = 2048 is the appearance of the fishes. 212 = 4096 is the appearance of the plants. 213 = 8192 is the appearance of the land animals (amphibians). 214 = 16384 is the appearance of the reptiles. 215 = 32768 is the appearance of the primitive mammals. 216 = 65536 is the appearance of the modern mammals. 217 = 131072 is the appearance of the primates (anthropoid). 218 = 262144 is the appearance of the ancestor of mankind (an ape). 219 = 524288 is the appearance and reaching their peak of the primitive man. 220 = 1048576 is the appearance and reaching their peak of the Old Man. 221 = 2097152 is the appearance and reaching their peak of the ancestor of human being (the New Man). 222 = 4194304 is the birth of human being’s civilization. 223 = 8388608 is the birth of the common (human) society. 224 = 16777216 is the birth of the beneficial (human) society. 225 = 33554432 is the peak of the beneficial society = the farming society. 226 = 67108864 is the birth of ancient civilization. 227 = 134217728 is the appearance of the first key Axial Age. 228 = 268435456 is the appearance of the Messiah. 229 = 536870912 is the appearance of the modern society. 230 = 1073741824 is the appearance of the modern scientific civilization. 231 = 2147483648 is the appearance of society of great war (group cannibalism). Chapter 72 Be aware, human beings! Death is only one promised thing and the last celebration and permanent peace. There is no promised thing other than death. There is no permanent thing other than death. This is the reason why there is life in death. The last celebration is the permanent peace after all. What has a beginning doesn’t have an ending. What doesn’t have a beginning has an ending. This is the reason why both the beginning and the ending have permanence. What has a beginning also has an ending. What has no beginning also has no ending. This is the reason why both the beginning and the ending don’t have permanence. That’s why only we human beings have the concept of death and are afraid of death. They have permanence, which proves that they are in circular motion. They don’t have permanence, which proves that they are in linear motion. Our “motion space of light and sound,” ranging from the micro universe of an elementary particle 10-16 centimeters in diameter to the macro universe of space 13.7 billion light-years, is in circular motion. From the 10-17 micro universe of an elementary particle to the 10 17 macro universe of space. From the one-13.7-billionth-lightyear micro universe of an elementary particle to the 13.7-billion-lightyear macro universe of space. “Motion space of light and sound” through the micro universe and the macro universe is in circular motion. Both the beginning and the ending are in permanent circular motion. We live our life, attracted by death (program) which is the last permanence since our birth which is the first permanence. Mankind history has done the worst. We mankind take a pride in the lord of all creation which is not only to commit suicide but involve the Earth with tremendous sufferings. Motherly Earth is now screaming everywhere. The issue of global warming is so tiny matter and natural phenomenon which is coming soon shall give us tremendous damages. However, we never say that it is natural disaster because it is surely artificial disaster. Human history supported by civilization. Negative heritage of civilization which the ancient times, the Middle Age, modern times and current modern times has been creating is now spouting out at a stretch. Is the new age coming? There shall be no new age after the ancient times, the Middle Age, modern times and current modern times. “According to the structure of the universe” is called because conventional common sense is broken. 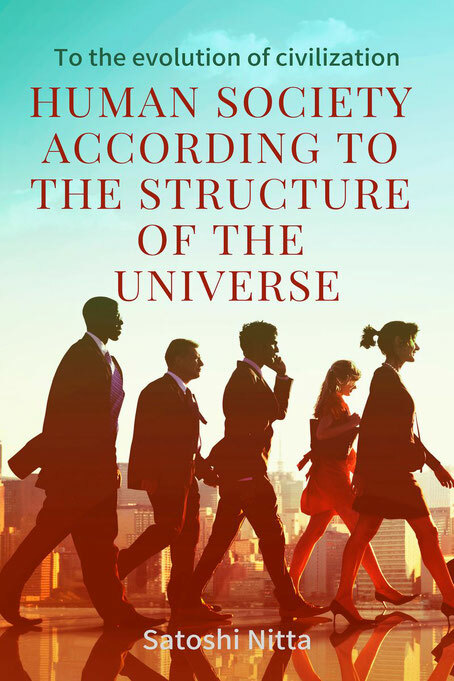 “Human according to the structure of the universe” which is breaking through conventional common sense called civilization shall be the ace for future human society. The purpose of this book is to have your reader go over the conventional common sense. I shall appreciate it very much if you read this book again and again so that you can master the new common sense.